The silvery white, downy young foliage of this Whitebeam or Mountain Ash tree is striking in the spring and develops into corrugated, grey-green large, rounded leaves with pale undersides. Corymbs of white flowers appear in April-May and are followed by orange-red berries in the autumn that are popular with the birds. Lutescens will grow in almost any position and will do especially well in alkaline, lime soils although acid soils needn’t be avoided. This attractive ornamental tree with an upswept, compact habit will tolerate pollution and exposed positions. Russet and gold autumn colour complements the vibrant berries. A very attractive small/medium sized tree to brighten up any space this Whitebeam tree will grow 6 x 3 metres in 20 years. Click here to go to all Rowan trees. Our pot grown Whitebeam Lutescens trees can be planted at any time of the year. Start by removing weeds and grass within a metre of your desired planting hole. Dig a square hole as deep as your root mass and approximately 2x as wide. To help the tree establish more effectively, sprinkle root grow in the hole. 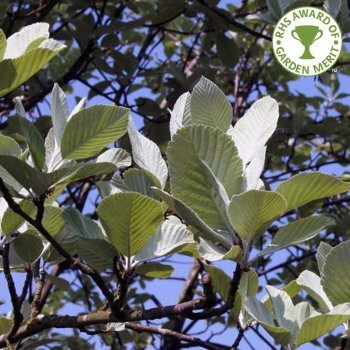 Whitebeam Lutescens trees require a strong framework to support their beautiful berries so it is good to encourage this by raising the crown in summer. Simply prune the lower branches and any crossing, damaged or diseased branches within the crown. Hard pruning of Whitebeam trees can be carried out in the dormant season, from autumn to winter.